4. 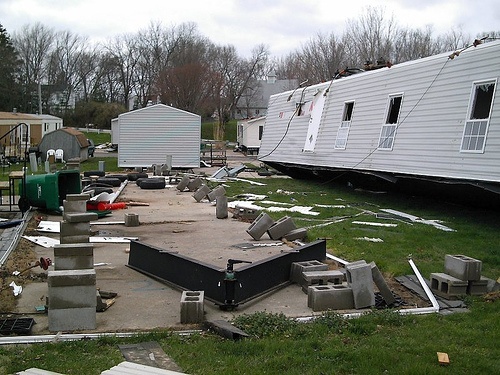 A tornado is more likely to hit a mobile-home park. We honestly don’t know where this myth started. A tornado is obviously not a living, thinking organism and there is no way for it to determine what is in it’s path, so this myth is by all means extremely silly, but it’s out there. At best, the myth was likely started due to the fact that pre-fabricated structures such as mobile homes are not built well and cannot withstand even the weakest tornado rotational wind speeds. The truth is, mobile homes are death traps. Many people don’t want to hear that and we’re sorry if that angers you, but it is still the truth. If you’re in a mobile home during a severe storm, you should immediately seek a more sturdy shelter. Do not attempt to shelter inside of a mobile home during an active tornado warning, the result is more often deadly than survivable! If you don’t have an underground shelter available, the best advice is to get in your vehicle and drive away from the approaching storm until you’re safe. If you don’t have time, then find the lowest area outside of the mobile home and lie flat with your hands covering your head.